Remember earlier this month when a newly digitized 19th century newspaper helped me identify Lucinda Dornon as the subject of an unlabeled photograph? What if I told you I did it again and found another photograph of Lucinda, and, in the process, uncovered more of her heartache? Lucinda, my fourth great-aunt who was sister to my third great-grandmother Anna (Dornon) Benedick, led a life marred by personal tragedies. During the Civil War, her family lost many of their possessions as they hurriedly fled invading Confederate forces. Her father died in his 40s before she was ten years old. In 1893, her husband Sylvester Scannel was killed in a prairie fire. 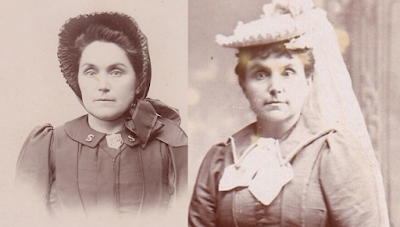 In 1904, she was judged insane and admitted to an asylum where she died just one month after turning 50. In the same family photo album as the recently identified photograph of Lucinda was a photo of a couple - perhaps a wedding picture - that was imprinted with the logo for the Wheeler Portrait Studio in Taylorville, Illinois. The back of the photograph included an inscription, "Al and Annie from Mertie and Lou." Al and Annie were my third great-grandparents Albert and Anna (Dornon) Benedick. But I hadn't identified a Mertie or Lou in my family tree, so the image was left unidentified. Recently digitized Kansas newspapers offered a series of clues that snowballed and culminated with the identification of the pictured couple. The mystery first revealed itself when I came across a brief blurb published on February 25, 1898, in the Rooks County society pages. I was puzzled. Who was the mysterious Mrs. M.L. Moore who was evidently a sister of Abigail? I had never come across any Dornon sister marrying a Moore. A key clue was in the location: Lucinda and her first husband Sylvester Scannel had lived near Palco, Kansas. That's where Sylvester was killed in the tragic fire. Following Sylvester's death, Lucinda had lived with her siblings, bouncing from her brother's home in Colorado to her sisters' homes in Plainville, about 15 miles east of Palco. Eventually, she moved to Illinois where another sister, Mary Susan (Dornon) Vandegraft, lived. Did Lucinda get married in Illinois and return to Kansas? Were her impending nuptials what she was hinting at when she wrote to her sister on the back of the previously-identified photo: "Sister dear... I have news for you... The sooner you ably answer this the sooner you will get the news. You will both be glad to hear it, I am quite shure [sic.]." 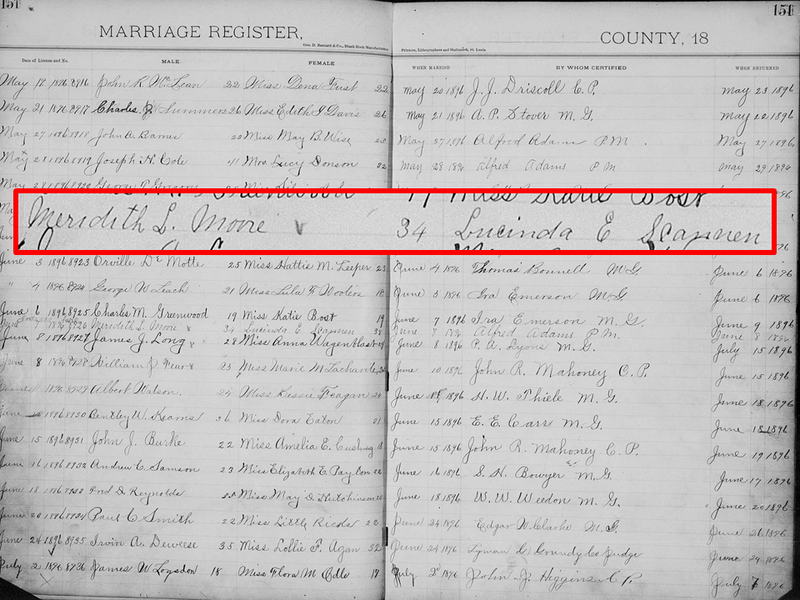 I was highly skeptical that I would find a marriage record for Lucinda in Illinois because I had already conducted that search. There were no hits for a Lucinda Dornon or Lucinda Scannel remarrying. But what would happen if the search was for a man surnamed Moore with a spouse first named Lucinda? It came back with a match in the Christian County, Illinois marriage registers. However, Lucinda's surname was misspelled as Scannen instead of Scannel. Apparently that was enough of a spelling difference to befuddle a handful of genealogy sites' search algorithms and overlook this marriage in my prior investigations. 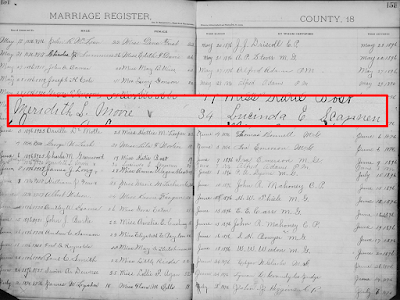 On June 7, 1896, Lucinda married Meredith L. Moore in Christian County, Illinois. Where was Christian County, I wondered? A Google search quickly provided a synopsis of the County's location, its demographics, and the county seat - Taylorville. I immediately thought of the photograph taken in Taylorville, Illinois that was sent from Mertie and Lou to Al and Annie. Were Mertie and Lou actually diminutives of Meredith and Lucinda? Both the name and location coupled with a strong resemblance with the previously identified photograph of Lucinda led me to conclude that the photograph was likely an 1896 wedding picture of Meredith L. Moore and Lucinda (Dornon) Scannel. It was just four months after the death of her sister Mary Susan (Dornon) Vandegraft when Lucinda (Dornon) Scannel married Meredith L. Moore. By November 1897, Meredith and Lucinda were living in Kansas. Apparently, though, it was an unhappy marriage. On March 4, 1898, the society pages wrote that M.L. Moore had returned to his former home in Illinois. For a visit? Permanently? The paper didn't clarify. In March 1898, Lucinda visited with her sisters in Plainville before returning home to Stockton in April. In May 1898, Meredith "formerly of Palco" along with his father returned from Illinois and were headed for Palco. The phrasing that Meredith was "formerly of Palco" was unusual and seemed to indicate that he was no longer permanently living there, and, perhaps, we could infer, not with Lucinda who had just returned to Palco the prior month. On May 27, 1898, the society pages wrote that G.W. Benedick visited his sister-in-law "Mrs. M.L. Moore of Palco" the previous week. There was no mention of Meredith. The curious comings and goings made more sense in July, when a divorce petition was published in the newspaper. 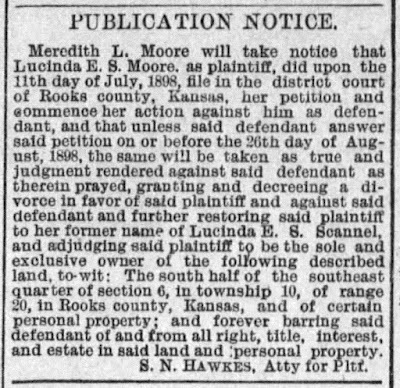 On July 11, 1898, Lucinda E. S. Moore filed for divorce from Meredith Moore. 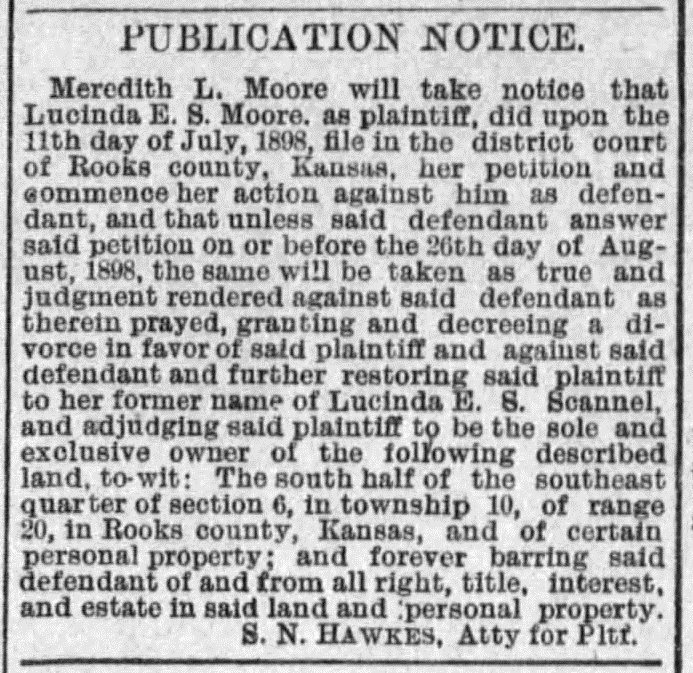 He had until August 26, 1898, to answer the petition, otherwise the court would grant and decree "a divorce in favor of said plaintiff and against said defendant and further restoring said plaintiff to her former name of Lucinda E. S. Scannel" as well as making her the sole owner of property near Palco. The divorce must have been granted. Nothing appeared in the society pages suggesting Meredith contested the petition, and Lucinda married Levi Stanley on June 11, 1899 in Gove County, Kansas. She was listed in Gove County's marriage register under the surname Scannel, further suggesting her divorce petition was granted in full. 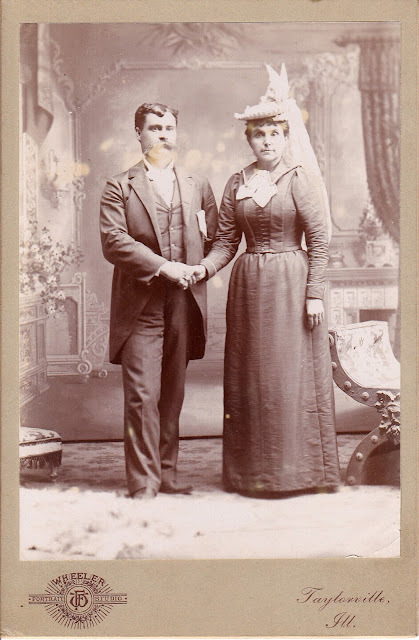 I am thankful that a recently digitized 19th century small town paper's nosy society pages helped me identify another unknown photograph, and surface the marriage, and, sadly, the heartache that Lucinda must have endured as she petitioned for a divorce in a very public manner. Digitized records are the gift that keeps on giving to genealogists. 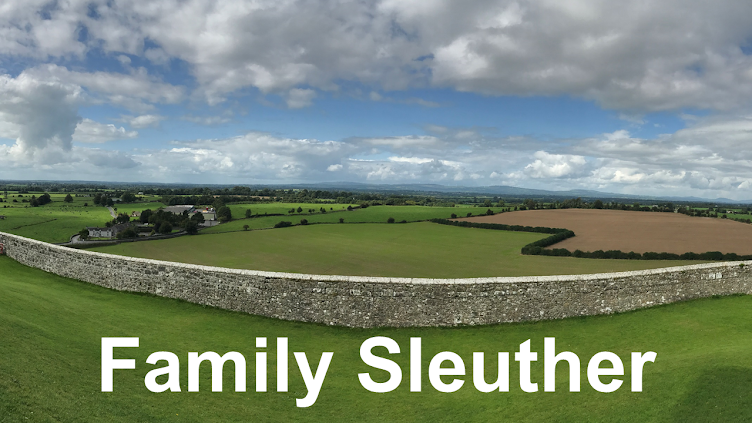 The increasing number of digitized materials that are emerging online underscore the imperative for family historians to return to our previously researched ancestors and see what, if anything, new we can learn about their lives. Another great discovery that evolved from newspaper articles! I love it. Great work, Michael. Thanks, Amy! It's a fantastic feeling to land on these discoveries. Digitize is the genealogist's mantra! This is an exciting find Mike. All those years ago when Grandma told me about Lucinda)'s husband dying in the prairie fire and then finding his grave was a "find" for me. Your sleuthing just keeps rewarding us with more directIons and finds. Thank you! And to think that I thought that old family album full of unlabeled photographs would remain a collection of unknown faces lost to history... This find is an important lesson for genealogists that clues sometimes surface that can help break through the brick wall. Terrific sleuthing. Those societypages are really great for relationships. And the newspaper notices about divorces can be amusing until one reflects on the heartache. Thank you, Schalene. I live for these recently digitized society pages right now. It's like trawling through an antique version of social media and prying into lives I care about.